Chylothorax (accumulation of chyle in the pleural cavity) is rare and results from localised damage or blockage of thoracic duct or its lymphatic tributaries in the thorax and characterised by elevated triglycerides and presence of chylomicrons. Malignancy is the most common cause of spontaneous chylothorax and depending on the location of thoracic duct obstruction or leak, 50% occur in the right hemithorax, 33.3% in the left side and 16.66% in both hemithoraces. Tuberculosis (TB), as the cause of chylothorax, is rarely reported even in hyperendemic countries such as India. There is no standardised management regarding TB-associated chylothorax; some cases were treated effectively with medical treatment alone, while in other cases, early surgery was done with quick recovery. We report a unique case of left-sided chylothorax due to TB in an adult who presented with hypotension and hyponatremia. A 50-year-old male was admitted for progressive breathlessness, weakness and decreased appetite for 15 days. There was no history of cough, chest pain or fever. The patient had a history of diabetes mellitus and hypertension with dilated cardiomyopathy. The patient was a non-smoker but had a history of regular alcohol consumption for 25 years. On physical examination, the patient was thinly built with signs of mild dehydration and had bilateral pitting pedal oedema. Pulse rate was 146/min, blood pressure was 84/60 mmHg and room air oxygen saturation was 90%. Respiratory system examination showed the features of left-sided pleural effusion. 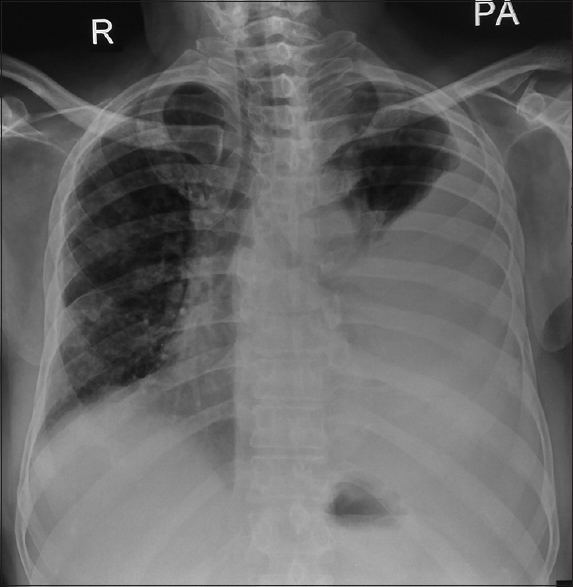 A posteroanterior chest radiograph [Figure 1] showed a large left-sided pleural effusion and patchy opacities on the right side. Urinalysis showed proteinuria and blood examination showed a total leukocyte count of 8.700/mm3 with normal differential, total protein of 6.0 g/dL (albumin of 2.8 g/dL), sodium of 121 mEq/L and random blood sugar of 224 mg/dL. A diagnostic pleural tap revealed freely flowing milky fluid [Figure 2]. Empyema was ruled out after the tested pleural fluid remained opalescent at the end of centrifugation, and pseudochylothorax was excluded after opalescence of pleural fluid cleared with addition of 2 ml of ethyl ether. Pleural fluid analysis showed a total of 930 cells with 96% lymphocytes, protein of 6.6 g/dL, lactate dehydrogenase of 118 U/L (serum level of 224 U/L), triglycerides of 478 mg/dL (serum triglycerides of 154 mg/dL) and cholesterol of 58 mg/dL (serum cholesterol of 166 mg/dL). All pleural fluid smears and cultures were negative. Ultrasound abdomen was normal except for a small umbilical hernia. Tube thoracostomy was done and approximately 2 L of pleural fluid [Figure 3] drained within 24 h. Induced sputum reports were negative and the patient declined to undergo flexible bronchoscopy. The patient was managed with total parenteral nutrition and hyponatremia was corrected with intravenous administration of hypertonic saline. The chest tube was removed after 4 days as pleural drainage ceased. Positron-emission tomography-computed tomography (PET-CT) [Figure 3] showed generalised lymphadenopathy [Figure 3], including mediastinal, retrocrural and retroperitoneal groups. Mediastinal lymph node biopsy was done through mediastinoscopy and histopathological examination revealed granulomatous inflammation with central caseation. The patient was started on anti-TB treatment with daily isoniazid, rifampicin, ethambutol and pyrazinamide. After 4 weeks, the patient returned to us with a recurrence of chylothorax and repeat tube thoracostomy was done. The patient was not willing for surgery and was discharged with chest tube in situ. Daily pleural drainage remained 100–200 mL and chest tube was removed at 4 weeks after the pleural drainage ceased and reexpansion of the left lung was maintained. Anti-TB therapy was continued with daily isoniazid, rifampicin, pyrazinamide and ethambutol for the first 2 months, followed by 4 months of daily isoniazid plus rifampicin. Chest radiograph [Figure 4] done at the end of 6 months of treatment revealed clearance of chylothorax and alveolar opacities in the right lung. The patient is currently doing well during the follow-up of 3 months. Thoracic duct arises from cisterna chyli at the level of second lumbar vertebral body and ascends between the aorta and azygos vein in the posterior mediastinum through the aortic hiatus of the diaphragm up to the level of fifth thoracic vertebra and then turns to the left side crossing the vertebral column before ending with an opening between the junction of left subclavian and left internal jugular vein. Thoracic duct transports digestive fat (chyle) from the intestines and hepatic lymphatics into the venous system at the rate of 10–100 ml/kg depending on the diet, intestinal absorption and the nature of the physical activity. Chyle is formed in the intestines and flows through lymph channels into the cisterna chyli. The colour of chyle relies upon the person's nutritional status and is usually milky, odourless, alkaline and sterile. Chyle is composed of proteins, lipids, lymphocytes, immunoglobulins, fat-soluble vitamins, electrolytes and water. Hence, loss of chyle and lymph into pleural space may cause malnutrition, hyponatremia, acidosis and hypocalcaemia in advanced cases. Immunodeficiency may develop if there is continued loss of lymphocyte-rich chyle. Our case presented with mild dehydration, hypoproteinaemia and hyponatremia. 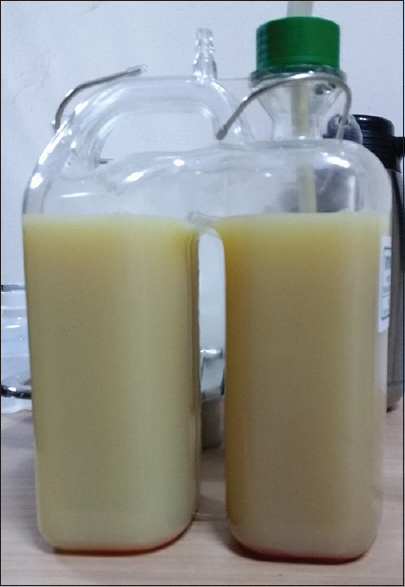 The detection of chylomicrons in the pleural fluid and pleural fluid triglyceride level of >110 mg/dL are diagnostic of chylothorax and our case fulfilled both diagnostic criteria. The pathogenesis of chylothorax secondary to TB is still not clear and postulated to occur either due to extrinsic compression of thoracic duct causing increase in pressure in the surrounding lymphatic system and resulting leakage of chyle into pleural space or direct involvement of thoracic duct by the TB of adjacent mediastinal lymph nodes. Lymphangiography can identify the cause and defect of the site and size of leak from the thoracic duct. However, we do not have this facility in our hospital. Left-sided chylothorax in our case could be due to enlarged mediastinal lymph nodes compressing the thoracic duct above the level of the fifth thoracic vertebra. PET-CT in our case was justifiable as malignancy is the most frequent cause of spontaneous chylothorax. Review of Indian literature showed a case of bilateral chylothorax showing culture positivity for mycobacterial TB along with cervical and abdominal lymphadenopathy and medical treatment without tube thoracostomy was effective. In another recent publication of right-sided chylothorax, biopsy of mediastinal lymph node through mediastinoscopy established tuberculous aetiology, and medical therapy was successful. A moderate left-sided chylothorax in an AIDS patient was successfully treated with anti-TB treatment alone, and CT scan showed enlarged retrocrural lymph node compressing the cisterna chyli. In our case, the PET-CT scan showed enlarged mediastinal and retrocrural lymph nodes; however, the exact site of thoracic duct involvement was not detected. In a recent review of 37 cases of TB-associated chylothorax, 45.9% had disseminated TB, and 72.2% of cases were diagnosed through the microbiologic tests. Conservative management with anti-TB therapy was effective in 94.4% of cases and only 17.1% required thoracic duct ligation and use of octreotide. In our case, there were lung infiltrations and generalised lymphadenopathy. Pulmonary TB could not be evaluated properly as there was no cough, induced sputum reports were inconclusive and the patient refused flexible bronchoscopy. The most important treatment option in spontaneous chylothorax is to identify and treat the underlying cause. Recently, an algorithm of stepwise management of chylothorax has been proposed, in which initial conservative management includes proper fluid and electrolyte replacement; dietary modifications such as non-fat diet, medium-chain triglyceride diet and bowel rest along with total parenteral nutrition; use of drugs such as somatostatin or octreotide or etilefrine to reduce the production of chyle and drainage of chylothorax with thoracentesis or tube thoracostomy to improve symptoms and pleurodesis if the above methods fail. Surgical treatment is by thoracic duct ligation through minimally invasive video-assisted thoracoscopic surgery or open surgical approach. In high-output chylothorax, percutaneous image-guided thoracic duct embolisation may be an effective alternative treatment option. If high-output pleural drainage still persists, pleuroperitoneal or pleurovenous shunt may be done as last resort. In adults, surgical management is recommended when pleural drainage persists beyond 2 weeks or there is a continuous pleural accumulation of chyle despite tube thoracostomy drainage and if there are complications due to nutritional deficiency or metabolic derangement. Our patient refused surgery and preferred tube thoracostomy drainage at home along with anti-TB treatment. In our case, pleural drainage of chyle was approximately 100–200 mL/day and ceased completely at 4 weeks. We are not aware of any previous report of TB-associated chylothorax with similar therapeutic experience in English literature. Agrawal V, Sahn SA. Lipid pleural effusions. Am J Med Sci 2008;335:16-20. McGrath EE, Blades Z, Anderson PB. Chylothorax: Aetiology, diagnosis and therapeutic options. Respir Med 2010;104:1-8. Singh S, Girod JP, Ghobrial MW. Chylothorax as a complication of tuberculosis in the setting of the human immunodeficiency virus infection. Arch Intern Med 2001;161:2621. Brotons ML, Bolca C, Fréchette E, Deslauriers J. Anatomy and physiology of the thoracic lymphatic system. Thorac Surg Clin 2012;22:139-53. Servelle M, Noguès C, Soulié J, Andrieux JB, Terhedebrugge R. Spontaneous, post-operative and traumatic chylothorax. J Cardiovasc Surg (Torino) 1980;21:475-86. Grobbelaar M, Andronikou S, Goussard P, Theron S, Mapukata A, George R, et al. Chylothorax as a complication of pulmonary tuberculosis in children. Pediatr Radiol 2008;38:224-6. Kant S, Verma SK, Anand SC, Prasad R, Verma RK. 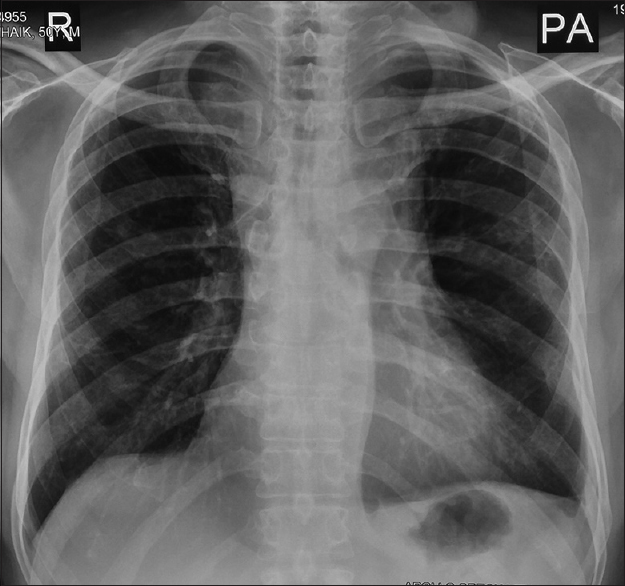 Development of bilateral chylothorax in a younger female secondary to tuberculosis. Lung India 2011;28:56-9. Amar JB, Zaibi H, Dahri B, Aouina H. Spontaneous chylothorax revealing a mediastinal and abdominal lymph node tuberculosis. Indian J Tuberc 2017;64:141-3. Bielsa S, Pardina M, Porcel JM. Chylothorax due to enlarged tuberculous lymph nodes. BMJ Case Rep 2014;2014. pii: bcr2014204582. Rajagopala S, Kancherla R, Ramanathan RP. Tuberculosis-associated chylothorax: Case report and systematic review of literature. Respiration 2018:1:260-8. Talwar A, Lee HJ. A contemporary review of chylothorax. Indian J Chest Dis Allied Sci 2008;50:343-51.